Malawi’s first female president, Joyce Banda, says that African women should not follow the “Western route” of assertiveness and confrontation as a way to gain a voice in politics. “If you want to take the Western route, all you will get is rejection, frustration. Confrontation will never work,” said Banda, Africa’s second female head of state, while speaking at the Sheroes Forum for female African leaders in business and politics in Dubai today (May 9). The former president described a women’s leadership training session in New York where she was given tips on being assertive, like standing up straight and looking people in the eye. “If I had done that, for example while talking to a traditional ruler in Africa, I would have been rejected immediately,” Banda said. Banda, president of Malawi between 2012 and 2014, is head of an initiative to encourage African women to run for office and has spent the last two decades lobbying for more female representation in African governments. Compared to their counterparts elsewhere in the world, African women aren’t doing so poorly in political representation. Globally, women accounted for only 17.7% of the world’s government ministers in 2015. In Africa, that figure was 20%, according to Inter-Parliamentary Union, a nonprofit based in New York. 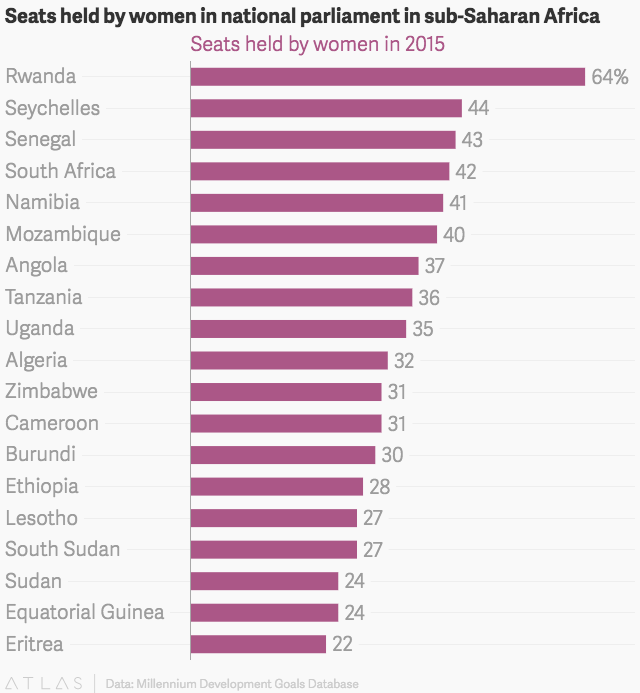 According to another measure by the United Nations, a little over a fifth of parliamentary seats in Africa are held by women. That’s more than the 19% of congressional seats held by women in the United States and about the same as the percentage of parliamentary seats held by women in the United Kingdom. 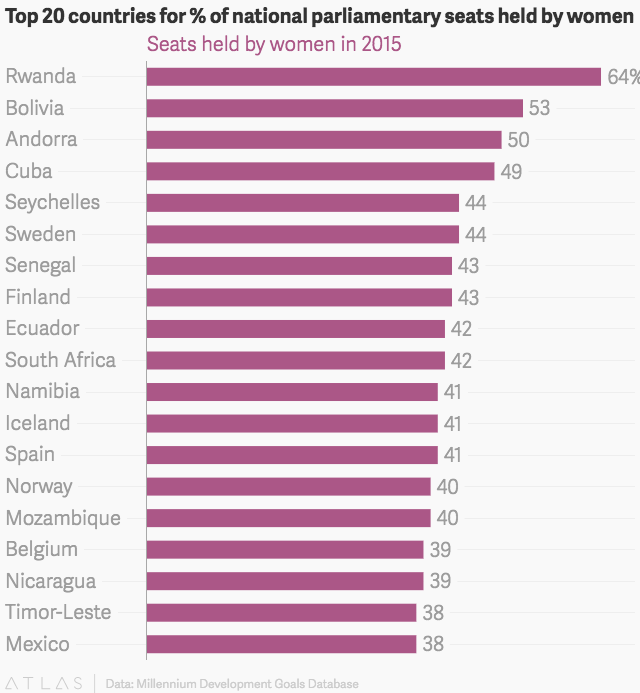 And of the 20 countries with the highest percentage of parliamentary seats held by women, six are African.